As I've mentioned in the past, I'm a fan of the Baby Einstein digital board books (dvds). I was happy ours would see more use when Lydia was born, and have been thrilled at the chance to review new ones as they've come out. Mom Central and Baby Einstein sent me a copy of their latest dvd that's due out September 29, 2009. 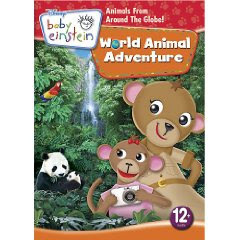 When I opened the package and pulled out Baby Einstein: World Animal Adventure , Lydia immediately recognized the monkey on the cover and wanted to watch it. We had to eat lunch first, but as soon as lunch was over, she had the wrapping off our new dvd! This dvd (or digital board book) follows the same format as the ones before, but it's a great formula. There are kids, there are puppets, there are moving toys -- and the best addition since Disney purchased the brand is the amazing videography. This dvd is full of wild animals from all over the world. Lydia surprised me by recognizing a couple that I didn't realize she knew (like the kangaroo!) She loved guessing what animal would come next, and laughed at the puppet shows. I wish they would have included the text for each animal, instead of only choosing a few animals to include text on the screen. I also wish they would let the images linger just a bit longer -- as Lydia wanted to talk about the animals and got a bit frustrated when the tiger was gone and replaced by a fox. I do like the fact that there is no plot to these dvds. It's perfect for a toddler / preschooler as there is plenty to talk about and no worries about missing part of the plot. The music is typical to the series, and not unpleasant to listen to. After the first viewing, Lydia watched it again and went to find 2 of her Baby Einstein board books to look at while it played in the background. She is very interested in animals at the moment -- especially wild ones so this came at a great time for her. I know she will enjoy it for quite a while yet!